Welcome to Tibet for trekking and expedition. This is a land where you can find the World Renowned foremost Mongolian Buddhist culture and heritages. Tibet is called "the roof of the World" as well, because of its location situated on the highest land of the world. This is a place where you can find unique Himalayan people settled around the snowy mountains' surroundings with their own different identity of culture and society; which is quite spectacular to observe specially to the Anthropologist. This is the autonomous part of China which the former homeland of His holiness the Dalai Lama who is presently residing at Dharamsala in India. Expeditions from Tibet on Everest, Cho Oyu and Shisha Pangma have become more popular these days due to very reasonable price for royalty and all the expedition costs. Furthermore, the land transportation access to the base camp of these mountains has made Tibet more attractive for mountaineering. 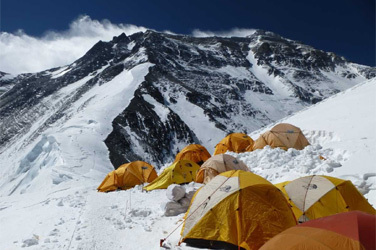 Simplified mountaineering rules and regulations for expedition in Tibet add more motivation to the mountaineers for their dream to reach the summit of 8000 meter Himalayas in Tibet. There are many Himalayan peaks having more than 6000m.Above in Tibet side among them the most popular are Everest 8848, Cho Oyu 8201m, Shishapangma 8035, Lakhapa Ri and Gurlamandata. These are all allowed for foreigners to climb. We provide all kind of arrangements to climb these peaks including climbing permission from China Mountaineering association and we have good link with porters and yaks to loads for expedition as well as guides, Cooks, Liaison officer etc so we are able to operates mountaineering and expedition in Tibet on professional way.